Was air conditioning all that prevalent in your time frame? I would think more fans and ventilators would be appropriate, along with chilled water slatted cooling towers in facilities requiring refrigeration. And "swamp coolers." I forgot about those. My layout is set near the California coast, an area lacking both reasons for effective swamp cooling: high temperature and low humidity. I've worked on roof units for many years, and the new compact, small compressor/fan motor types as these wouldn't be around with steam engines. Ammonia pumps and cooling towers maybe. But fine work as usual, thanks for publishing your blog. Bill, you would bring that up! An engineer colleague told me much the same. The problem is partly a model problem. 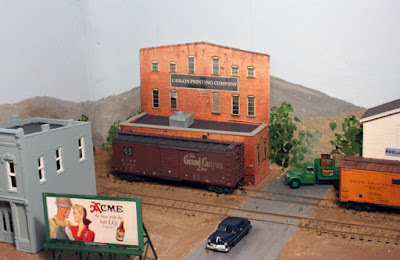 Cooling towers look great, but an issue is that model buildings, mine anyway, aren't very big. Charles: I do plan to add more ventilators (future post). Do you know of anybody who make a swamp cooler detail? I know someone makes window a/c units, but I do not remember who. My recollection of the prototype is dominated by louvers on the sides of the unit, like the doors on first-generation diesels, but my memory probably only includes a few units, so don't take that as gospel for all models. I'm not aware of one in model form, but an approximation would not be hard to build. 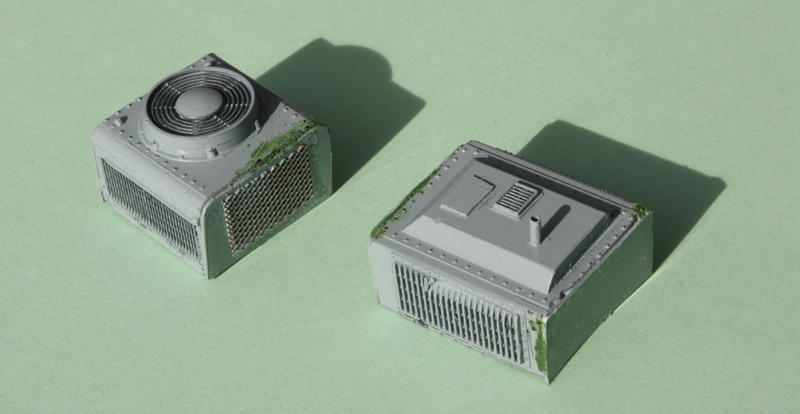 BTW, the Walthers roof set 933-3733 does have two small swamp coolers. Might have to play with some styrene with styrene quarter round, with some Archer louver decals.